Every book lover enjoys the Best Books lists that come out every December, but what I look forward to most is seeing how spot-on book bloggers are when it comes to choosing the next best thing. 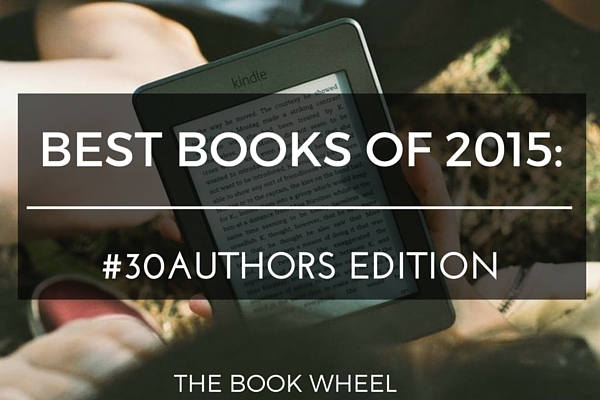 Each year, I run an event titled #30Authors, which is 30 authors reviewing their favorite books on 30 blogs in 30 days. I hand-pick each and every author who participates and while many of them are based on books I have read, I also pick those who are popular within the blogging world. Steal the North by Heather Brittain Bergstrom – Named a finalist for the 2015 Washington State Book Award in Fiction. Bull Mountain by Brian Panowich – Since launching to astounding critical acclaim this summer, including rave reviews from Marilyn Stasio at the New York Times Book Review (“astounding”), Wall Street Journal (“a satisfying and smartly constructed book…explosive”), and Esquire (“prose as punch as rapid-aged whiskey”), Bull Mountain has been selected as iBooks’ Best Thriller of 2015 and was an Amazon Best Book of the Year on three lists: Editors’ Picks – Top 20, Best Debuts, and Best Literature & Fiction. Five Night Stand by Richard Alley – Alley has a story in the recently released anthology Memphis Noir (Akashic Books) and is hard at work on his next novel. Paris, Rue Des Martyrs by Adria Cimino – Adria’s book became an Amazon best seller this year, and she was invited to join Tall Poppy Writers, a community of writing professionals committed to connecting authors with each other and with readers. Adria and fellow author Vicki Lesage, who operate their own independent publishing house, Velvet Morning Press, have also started a free daily book deals newsletter called “BookStar,” featuring books by and for women. Come Away With Me by Karma Brown, reviewed by Mary Kubica – The book Mary reviewed, Come Away With Me, became an international bestseller this fall/winter, and the author Karma Brown also signed another 2-book deal with MIRA Books! The Bookseller by Cynthia Swanson – The Bookseller: A Novel was a Goodreads Choice Awards 2015 Semi-Finalist for Historical Fiction – it releases in paperback on March 22, 2016. Our Endless Numbered Days by Claire Fuller – Fuller had an amazing 2015. Her first novel, Our Endless Numbered Days was published in six countries (another three to come), won a major prize – the Desmond Elliott prize for debut fiction, and she sold her second book, Swimming Lessons, to Penguin. Black River by S.M. Hulse – The Seattle Times critics included BLACK RIVER on their Best Books of 2015 list and Library Journal named the BLACK RIVER audiobook (narrated by George Newbern) as one of the Best Audiobooks of 2015. Three Rivers by Tiffany Quay Tyson – Tyson has been flexing her writing muscles by contributing to Huffington Post and BlogCritics, as well as diving into the book club world with her new Reading Group Guide! Did any of these best books make your list?